A cultural ambassador of his country. 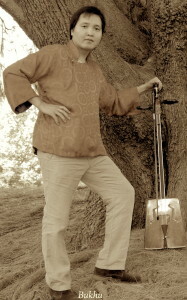 Bukhu combines virtuosic Morin Khuur (Horse Head Fiddle) and Khuumii (Harmonic Overtone Throat Singing) skills to transmit the harmony of Mongolian nomads and Shamanic culture through time and space. Bukhu’s music brings a contemporary take on the tradition of Mongolian bards of the middle ages and those of ancient times, acting as a national memory bank by working mythologies, historic figures and events into traditional verse form. Bukhu is a member of Sydney bands Equus and Horse & Wood, and former member of the Morin Khuur Ensemble, Khangal Quartet and Domog folk bands of Mongolia. Touring extensively for audiences in Italy, France, Belgium, Germany, Austria, Switzerland, Denmark, Luxembourg, Czech Republic, Japan, Korea, Taiwan and Australia. Bukhu embodies the spirit of reinterpreted narratives through verse, with an enchanting mix of folk traditions and contemporary influences woven into the fabric of his arrangements. An accomplished composer of contemporary music in his own right. Bukhu’s compositions incorporate genres as diverse as Overtone Throat Singing, Harmonic Chant, Folk, Classical, Blues, Metal, Techno, Dub and Hip-Hop. Bukhu’s recent live performances explore experimental and electroacoustic sound palettes — using loops and edits created on pedals, portable devices, samplers, synthesizers, sequencers and drum machines. Unbelievably beautiful and haunting music. Please tell me where I may be able to purchase Bukhu’s CD. I have been unable to find a link on this web-site or on Amazon. Thanks for your kind words! Recordings will be available soon via itunes and amazon. In the meantime, you may purchase digital and phyical copies of Bukhu’s music via the links provided below. I’m excited to see your playing at the Illawarra Folk festival. I met you at the Cafe Carnivale gig in early November. I was the conga player playing with the Iranian group ‘Madakto’ that played after you and Nayika Group. I hope we can catch up at the festival and maybe even have a jam. If you are around you are welcome to join my band the Beatmeisters for a song or too also. Cheers and see you in January. I hope you enjoy the instrument you got from me at Woodford this year. I hope you and your family are all well. To what email address should I send the invoice? Seen you at the Newtown Festival and I thought your music was excellent. I will hopefully catch you somewhere in the next month or two. Heading to Mongolia in the next few months and will hopefully see more of this music. Keep up the amazing, thought-provoking and inspiring music. Thank you for your comment, if you want some info about Mongolia, feel free to ask me. Used to watch you busk/play in Newtown a couple of years ago (or so it feels) and bought a CD off you there. Am curious because the CD says Domog on it – I thought that was your name. It is mostly cross over stuff, and some of the more hip-hop tracks are awesome too. Have just caught your real name from Angela Mesiti’s ‘Citizen Band’ installation at the Art Gallery of NSW – in which you perform a mind blowing piece. Well done! Thoroughly enjoyed your performances at Port Macquarie and Taree. You are indeed a rare talent and my ears are still celebrating the experience of these performances.